Note: these were originally written to apply to Holland Lops, which is a dwarf rabbit breed. However, these questions and answers apply to most breeds of rabbits including Mini Rex, Netherland Dwarfs, Fuzzy Lops, Polish, Dutch, Jersey Woolies, and more. For another excellent rabbit FAQ list, please visit the ARBA website. Q. How long do Holland Lops Live? A. The lifespan of a pet dwarf rabbit is usually between 7 and 12 years. To extend the life of your pet Holland Lop, consider neutering or spaying. Excessive breeding of does can shorten a doe’s lifespan. Q. My dwarf bunny has a patch of thin fur between the shoulder blades with white flakes. What is it? A. I would treat my Hollands for fur mites if they showed those conditions (plus twice per year as a prophylactic) . I use Ivermectin 1% for goats (injectible). I give 0.08 ml for a 3 lbs. rabbit or 0.1 ml for a 4 lb. rabbit. It works out to just about 3 drops per rabbit, given orally. I repeat after 8 to 10 days. I have seen many recommended doses that are too high. Please consider that 1.0 ml is the appropriate dose for a 75 lb. goat! One a 3 ml syringe, 0.1 is just to the very first hash mark. On a typical 5 ml syringe, it’s halfway to the first hash mark. Q. My new Holland Lop has ears that stand up straight. Will they ever lop? A. Ears on Hollands will lop sometime between 3 weeks and 6 months, and perhaps occasionally later (even as late as three years). Bunnies that have narrow crowns or are slow-maturing will lop later. Bunnies with wider crowns or long and heavy ears, and those that mature more quickly will lop sooner. Almost all Holland Lops can exhibit ear control when they are excited. Ear carriage should be evaluated when the bunny is relaxed. Q. How old should my Holland Lops be before I breed them? A. Even though Holland Lops may be able to reproduce as early as three or four months old, wait until they are six or seven months old. Does have an increased chance of fetal death and complications. Bucks may suffer a lack of early success that effects their future breeding potential. Q. When is a dwarf rabbit doe too old to breed? A. The age that does stop producing offspring varies. Some breeders have experienced a noticeable drop-off in fertility after age 3. Some does produce regularly to age 5 or after. I even heard of one doe that was still having litters at 8! Older does should be kept in production (as long as their health is good), otherwise their fertility may be permanently lost. Q. Which gender makes a better pet? A. Generally, male rabbits have better personality. Females, or Does can become defensive of their potential nesting areas. Spaying or neutering makes either an even better pet. It is worth mentioning that a number people have unaltered pet does that are wonderful. Q. Do male rabbits always spray urine? A. I have a number of bucks that never spray and a few who have sprayed for a short period in their lives (after moving here, for example). I have had no bucks spray on a long-term basis. The problem of spraying is overstated, in my opinion. Q. Do rabbits like carrots and lettuce? A. Yes, they do like them. But carrots should be regarded as a sugary treat and lettuces should be avoided altogether. A 1-inch slice of a large carrot or one baby carrot is enough for a daily treat. Some of the higher fiber leaf lettuces may be tolerated by some rabbits, but head lettuce can cause a watery diarrhea and lead to death. By the way, most rabbits actually prefer the green carrot top over the carrot itself. Some pet rabbits have been killed by being fed carrot-only diets or too much iceberg lettuce. Q. How much do Holland Lops weigh? A. My adult Holland Lops have ranged from 2 pounds 12 oz. to 4 pounds 12 oz. Holland Lops may be a bit smaller or a bit larger than that, but most fall between 3 and 4 1/2 pounds. Q. Do pet Holland Lops need shots like puppies? A. Being caged animals, rabbits do not require shots such as rabies. Vaccinations are not necessary. Always check with your vet for recommendations. Q. Is there any preventive medical care necessary for Holland Lops? A. I worm my Holland Lops once a month with Safeguard for horses and treat them twice a year with Ivomec. Check with your small animal vet for recommendations. Please see our section on rabbit health care for more information on preventive medical care, and treatment of common illnesses. Q. How big should a show Holland Lop’s cage be? A. I believe that 24″ x 24″ is the smallest size that a doe with kits should have. Bucks, young rabbits, and dry does can be housed in a 18″ x 24″ cage. Indoor rabbits may be housed in a slightly smaller cage (15″ or 16″ x 24″) as long as they spend part of their day outside their cage. Q. How many litters can a female rabbit have each year? A. In theory, they could have 12, with their 31 day gestation period. In the wild, rabbit mothers may have about 7. But 3 or 4 per year is a healthy number of litters for a Holland Lop per year. Q. How many kits will my Holland Lop doe have per litter? A. I looked at my last forty litters and found that there were an average of 3.2 live kits per litter. If I ignore the completely dead litters, the average is 3.8. For those who like statistics, the median was 4 and the mode was bimodal at 0 and 6. The minimum is obviously 0 and the most I’ve heard a breeder report from her herd is 13. I should note that I breed does twice, one hour apart. Also, some lines of Hollands are better producers than others. That is to say, your actual results may vary. Q. Is it common for baby rabbits to die? A. In my last 30 weaned litters, 13 litters had no deaths. Seventy-six percent (76%) of the kits born live, lived to be weaned. Remember that peanuts always die and are part of the 24% that died in the nest box. I did have 44 kits in a row that were weaned without any nest box deaths. I thought perhaps I had become a better barn manager, but I have lost a couple of babies lately. I think that some loss in the nest box is inevitable. For first time mothers, the kits are born dead approximately 50% of the time. Q. How much money do you make breeding and selling Holland Lops? A. Raising and showing Holland Lops is a hobby that generally costs more money than it generates. I hope to manage my hobby to the point that someday the income matches the outgo (I doubt I’ll ever recoup my initial investments), but that’s a lofty goal. In my opinion, there is only one reason to raise show rabbits: for the love of it. There are some creative ways to make some extra cash with your rabbits, if you are going to be keeping rabbits anyway. Q. Is red urine from my rabbit a sign of a dangerous medical condition? A. No, unless the consistency is more like blood than urine, your rabbit is not sick. Normal rabbit urine ranges from a color that looks like lemonade with milk in it, to orange juice with milk in it, to fruit punch with milk in it. Sorry if I just ruined all of your favorite beverages. Red in urine is undigested protein. Q. When can I rebreed my doe? A. If a doe has nursed a litter, you can rebreed as early as five weeks after kindling. The doe must be in very good condition. Otherwise, I wait until the kits are seven or eight weeks old to rebreed. If the doe has a dead litter, I check her vent the very next day and rebreed her if she is healthy and her vent has returned to normal. Q. What should I feed my Holland Lop dwarf rabbits? A. I feed my Holland 3 oz. by weight of professional extruded pellets (Blue Seal Show Hutch Deluxe), unlimited low protein hay, and water. I give my show rabbits 1 tsp. of Show Bloom. In the winter, I give rabbits ages 4 months and older 1 tsp. of raw oatmeal (old-fashioned, not quick or instant). I occasionally give my bunnies raw sweet potato, herbs from my garden, kale, a chunk of banana or raspberry leaves. There are numerous other acceptable treats which may be given in very small quantities once per day. Please see our extensive section on rabbit feeding and nutrition. Q. When can my young rabbit begin having treats? A. I think it’s best to wait until the Holland Lop is at or near adult weight before giving treats. It’s always possible that a treat would not agree with your rabbit and cause a reaction such as diarrhea. An adult-size rabbit has a better chance of coping with the change in the diet and any resulting reactions. Treats should be introduced slowly, one at a time, with observation of any ill effects on your rabbit. Rabbits need very high fiber diets. Q. How old should a Holland Lop baby be when it goes to a new home? A. Unless a kit is being sold with its parent, it should not leave the barn until it is 8 weeks old and fully weaned. In some states, it is illegal to sell a rabbit before the age of 8 weeks. I generally remove the dam from the litter at 7 weeks if they are weaned and leave the litter together for another week to lessen the stress of being without mother. Then the kits are technically ready for new homes. A three- or four-month is in a much better position to withstand the stresses of moving to a new home, however, and can weather a mild illness better than a baby. Especially families with young children should consider a junior rather than a baby. I do not sell rabbits below the age of 3 months any longer. Q. When is Holland Lop fully grown? Q. How are rabbits shipped? A. Rabbits are shipped by airplane in a specially prepared carrier through a special program offered by the airline for companion animals. They are taken to the airport shortly before their flight and should be picked up promptly when they arrive to minimize any stress the trip would cause. Don’t worry. Rabbits aren’t mailed! The cost of shipping is in the neighborhood of $200. Q. How can I find a Holland Lop for sale in my area? A. Here at the Nature Trail we maintain a Holland Lop Rabbit Breeders Directory. 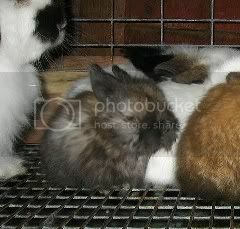 You can also go to the Holland Lop Rabbit Specialty Club’s website at www.hlrsc.com. There you can click on both “Locate a Breeder” for breeder email addresses, and “Links,” where you can choose to browse through websites by members sorted according to state. Chances are you’ll find one that either lives or shows near your home. Q. Can my two dwarf rabbits share a rabbit cage or rabbit hutch? A. Generally, rabbits of any breed should have their own cages. Occasionally, un-neutered females raised from birth together may be able to cohabitate without incident. Altered rabbits (spayed or neutered) may become a bonded pair and live happily together. Otherwise, you can expect females to scrap by the time they are 6 months old, at the latest. Males may begin to scrap around 3 to 4 months old. Pairs of opposite gender may breed as young as 3 months old, with disastrous results. Q. My Holland Lop is sneezing a lot and has white mucous coming from its nose. Its front paws are wet and matted from the discharge. What should I do? A. First, separate the bunny from any other rabbits you have. Your bunny may have snuffles, which is like a human cold. But unlike a human cold, it is deadly. Read up on snuffles on the web and give your vet a call. Q. Why are kits sometimes fostered to other rabbits? A. There are at least five reasons that I may foster kits to another rabbit. First, I will consolidate small litters so that single babies are not overfed, possibly leading to obesity and splay legs. Second, I will consolidate litters so that one doe may be made available to sell. Third, I will foster kits to make a doe available to rebreed sooner (I don’t think this should be done for every litter, but I will do it after a small litter if the doe is in good shape). Fourth, I will foster babies to a doe that has lost her litter in an attempt to help her hone her mother instincts and perhaps help her reproductive hormones along. Fifth, I will foster kits to even out litters, relieving the burden on a dam with a large litter. Q. My rabbit’s head has suddenly started to tilt to one side. What is it and what should I do about it? A. A head tilt is known as wry neck. It can be a slight tilt like a quizzical look or it can be a total tilt with the bunny’s eye on the floor. Wry neck is a symptom rather than a disease and it can have many causes. I have found that a slight tilt is more likely to be an ear infection, which I treat with an antibiotic ointment in both ears. A significant tilt can be either injury, internal parasites or a variety of diseases. I treat significant tilts with Safeguard and Ivomectin (4 drops per pound) and have treated babies are young as 3 weeks. The babies seem near death for a couple of days, but so far they have all survived and had full recoveries. I know breeders who treat wry neck with Pen B injections. Since this is a medical condition, I must advise you to check with your vet before treating a rabbit for wry neck. Q. Can my dwarf bunny live outside during the winter? A. In all but the coldest of US winters (and hottest of summers), bunnies can live safely outside (0 degrees is no problem, but I can’t vouch for -30 or 110 degrees). It is important that your rabbit have a place to get in from the rain, wind, and sunshine, though. A roof and one solid side is minimum, but a small wooden enclosure is better. You may want to cover your hutches with tarps during really bad weather and bring bunny inside anytime there is a severe weather warning for outdoor animals. If you live in an area of extreme weather, try to locate breeders in your locale for specific tips for your location. Next Article: What to do when your rabbit needs his teeth trimmed.